​ROUND ROCK, PFLUGERVILLE, HUTTO – In the late 2000s the national housing bubble burst, and there was a crisis with subprime mortgages, putting the country in a financial tailspin. Now, nearly a decade later, the area has recovered, and the resurgence of building commercial and industrial space is a sign of economic stre​​​​ngth. Spec buildings, built without any secured tenants, show faith the market will continue doing well and that the buildings will continue to be leased for years to come. The process starts with developers securing loans from lenders who are willing to invest in the idea of a fully leased building. 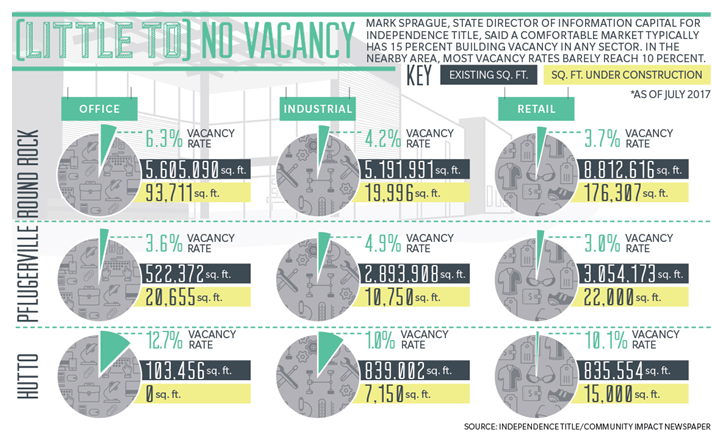 In Pflugerville, vacancy rates are low with office, retail, multifamily housing and industrial space under 8 percent. ​Check ou​t more Mixed-Use stories across Texas.